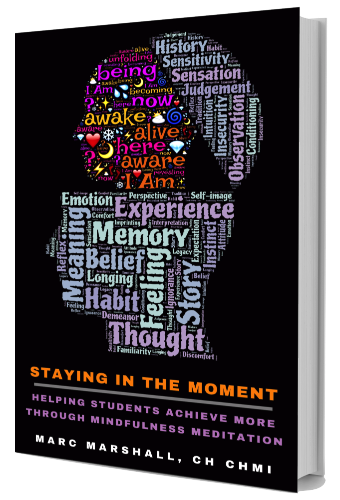 WESTFIELD, N.J. - April 17, 2016 - PRLog -- Westfield's resident hypnotist and mindfulness meditation instructor, Marc Marshall, has just released his book, "Staying In The Moment - Helping Students Achieve More Through Mindfulness Meditation". The purpose of this book, available on Amazon Kindle, iBook and Kobo, is to help educators, parents and students get better results and change the way they approach the entire educational process. Marshall, who has taught students in alternative high school environments, took the tools that he regularly provides his private and corporate clients and applied them to his classrooms. Noting that students often face challenges that can hinder their learning progress, the mindfulness meditation instructor introduced the practice in each of his classrooms. The mindfulness assisted students in improving focus, self-esteem, behaviors and reduced depression and anxiety, all of which helped them perform better. Marshall's program fits firmly within the framework of 21st century learning requirements that shape the curriculum for schools throughout the country. He cites studies in his book that show how both teachers and students benefit from the implementation of mindfulness in the curriculum. The book contains exercises that are easily modified for the age level being taught and fit comfortably into any teacher's daily lesson plans. Major corporations such as General Mills, Adobe, Facebook, Google and Rolls Royce, as well as professional sports franchises like the San Francisco Giants and Seattle Seahawks, currently offer or are considering mindfulness training. They cite benefits such as reduced stress, burnout, and anxiety, while increasing motivation, as the major reasons for implementing these programs. Educators throughout the U.S. are beginning to take notice of these benefits and are seeking ways to integrate the practice in their classrooms. Marshall, known professionally as HypnoMarc, is a certified consulting and stage hypnotist and mindfulness meditation instructor. He is a frequent presenter to companies and organizations in the areas of motivation and team building, as well as entertaining audiences throughout the U.S. with his comedy hypnosis show - HypnoMarc's Hypnotic Hijinks. Information about his services can be found on his website - www.hypnomarc.com or by emailing him at - info@hypnomarc.com.